New restaurant, located in the BaiLian Chuansha Shopping Mall, Shanghai, marks Katrina’s entry into Shanghai and the start of its partnership with Ajisen Group to grow the So Pho brand in China and Hong Kong. Katrina Group Ltd, an F&B group specializing in multi-cuisine concepts and restaurant operations, announced that it has opened its first So Pho restaurant in Shanghai under the joint venture company, So Pho International Limited. The JV is with Big Benefit Group Limited, a wholly-owned subsidiary of Ajisen (China) Holdings Limited. Katrina Group’s outlet in Shanghai is approximately 1,162 square feet with a seating capacity of 42. 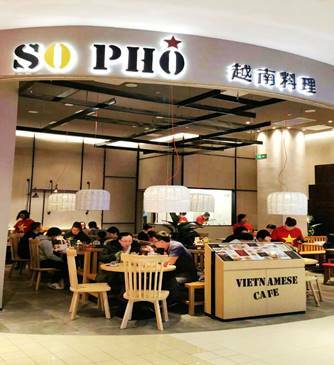 The location of its maiden outlet enhances the Group’s ability to raise the So Pho brand profile to a wider consumer mix, thus helping to pave the way for further expansion in the region. The BaiLian Chuansha Shopping mall is located in Chuansha New Town in the Shanghai Pudong New Area. The Pudong area is a financial hub of modern China and one of the most populous districts in Shanghai. Nearby landmarks include the Port of Shanghai, the Shanghai Expo and Century Park, Zhangjiang Hi-Tech Park, Shanghai Pudong International Airport, the Jiuduansha Wetland Nature Reserve, and the Shanghai Disney Resort. The group has also opened three new restaurants in Singapore, one each in Causeway Point and Northpoint City under the brand name “So Pho” and one at Suntec City under the brand name “Streats”.